I love being a Sonlight Mom. The books, the memories, and the learning are wonderful. But, has anyone else found that they aren’t moving at the same rate as the suggested schedule? We are speeding through bible and history, but taking longer than expected with language arts. Science is falling somewhere in the middle. We are progressing at a drastically different pace for our subjects. The massive Sonlight binder that I love and which explains everything, is becoming more cumbersome to flip through. I’m losing track of where we are with each subject. Fumbling through the binder is shaking the calm that the daily, ready made Sonlight calendar normally provides. At this point I have a couple of options. I can let panic overwhelm me and start to derail our plans. Or I can find a way to focus on the positive things we enjoy about our day and move forward with fixing the parts of our day that aren’t going well. The good news is that the fix for us was super simple and has us back on top of our day! 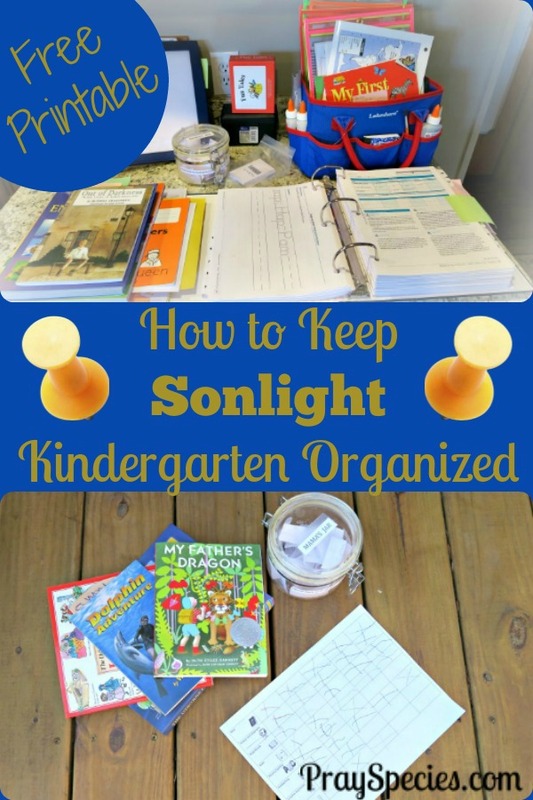 Here are my quick tips for keeping Sonlight kindergarten under control! I also included a free picture based weekly schedule for our kids to use just for you! I have three goals for keeping Sonlight Kindergarten under control. Wrangle the Sonlight Binder into a more functional reference for me. Provide my homeschool student with a record of her work. Determine milestones to help my homeschool student celebrate her accomplishments. The Sonlight binder is enormous. It has tons of useful information that can be used to help guide your homeschool year. Having everything in one place is incredibly convenient when you are working to keep the attention of our young ones, but can be discouraging when you have to flip between different weeks and subjects. Our simple solution to avoid flipping aimlessly through the binder follows. Place color coded sticky notes on the current weekly schedule for each subject. and blue for history, geography, and religion. We frequently complete a week worth of science or history in a couple of days. Language arts takes us at least four days or longer to complete. The sticky notes sticking out of the binder help me to quickly and easily turn to the next activities listed for each subject. So, even though we are on week 13 for language arts, week 19 for science, and week 24 for history, I still have the binder under control. Mark off each section as it’s completed. We follow Sonlight’s suggestion and mark each completed section with our children’s initials. If you have to move ahead without completing an activity, create a separate list referencing the page number of the incomplete activity. Keep this list taped to the front of the binder. This has happened to us with language arts. Once we were struggling with a reader, but were ready to write some different letters. We simply moved on and returned to the reader a week later when we were feeling fresh and ready to try again. Another time, we were unable to complete a brain game, but we added it to the list on the front of the binder and came back to it when it was more convenient. Place color coded index cards in the books currently in use. List page numbers to be completed for the next day and possibly a few additional days if you or your child are apt to work ahead. This way you can quickly flip to the right location in the book without having to lug around your entire binder. Once you’ve completed your readings for the day, go back and record your completed work in the big binder. Keep the student worksheets in a separate binder. I retain a master in the big binder and can create or purchase additional copies if needed. I have three different sections of worksheets, each divided by a page protector: copy work sheets, vowel work sheets, and science work sheets. The “letter sheets” are kept in the front of the binder. As each of the worksheets is completed it goes into a binder my daughter gets to keep so she can show off her work and review it on her own time. Since some of the worksheets get destroyed when she “shows them” to her younger siblings, I often take a picture of her completed work before placing it in her binder. Pull out the separate read aloud section. We move faster with read alouds than any other part of our curriculum. We frequently enjoy the read alouds outside of our seat work and benefit from having the vocabulary and questions in a readily accessible smaller binder. Create a record of completed work. Now that my teacher materials are organized I feel a great deal of peace. My daughter on the other hand still wasn’t sure what to expect in her day. Like many her age, she thrives on routine and knowing what to expect. So, I created a simplified schedule that allows her to mark out different subjects as they are completed. The schedule hangs on the refrigerator at a height she can reach, but the toddler cannot. At least for now. I also have a bonus section at the very bottom. Here we list readers we didn’t complete, science experiments that didn’t get done, or activities we came across in her history lessons that she wants to try. If we X out all the spots on her schedule, but don’t get to the bonus items, we re-evaluate to see if we still want to do them. If we do, we just move them to the next copy of the schedule. There must be an X in each box for her to get another weekly schedule to complete. I never keep her from working farther on subjects, but all the boxes in every subject have to be checked off before she can get a new sheet. Since we read bible every morning and she loves read alouds those boxes almost always get checked off first. We keep reading bible and read alouds, but she doesn’t check off additional boxes in these subjects until all the other subjects on her sheet are also completed. This keeps us from working too far ahead or ignoring any one subject for too long. You are welcome to a copy of this Sonlight Kindergarten Weekly Checklist to use with your Sonlight kiddo! It’s free of charge and you don’t have to sign up for anything, just download and enjoy. Determine milestones to celebrate accomplishments. My kindergartner has never responded well to reward based incentives. Even as a potty training toddler salty snacks, big girl underpants and other perceived rewards failed miserably. So, I wanted to find a way to acknowledge her hard work and progression without it being misconstrued as a bribe for completing work. We did this by establishing a collection of activities and items that she thought would make a great way to celebrate her progress. They included things such as getting to pick what we had for dinner, staying up half an hour past her regular bedtime, and taking a trip to the garden center. She’s a flower addict, just one of the many things I love about her. Each time a Sonlight Kindergarten Weekly Checklist is completed, meaning all the boxes are checked, she gets to pick a slip of paper out of the “Mama Jar.” Each slip of paper contains one of the ways she wishes to celebrate her milestones as determined at the beginning of the year. So far this has worked very well for us! We also told her she could pick a large celebratory adventure or item when she completed the entire year. She is lobbying for a chicken! I’m loving watching her peruse the different books and web sites with her Daddy to decide exactly what type of chicken she would like the most. Watching her learn as part of the celebration process is a reward in itself! Want to learn more about our experiences with Sonlight? Check out more of our Sonlight posts! Love your ideas with this. My son also does not respond well to “bribery” and I think the Mama Jar sounds perfect.